Published on 2016-02-16 in photography, software and Uncategorized. Still am. However, while looking for a replacement for Picasa (boo! bad google) for Wen, I did discover that my Photography Subscription to Adobe (Lightroom + Photoshop) also includes a neat little Photographic Portfolio generating tool. Here’s what it did in 15 minutes. Published on 2014-03-06 in media, photography and technology. Getty Images are now allowing non-commercial use of their image library for free. The images are fixed in size (as above) with the text and links below included. They say that their photographs appear widely on the internet anyway, illegally, so at least this way the metadata (photographer’s credits and a link back to Getty) remain intact. They also might add advertising later, according to the small print, although there is no mention yet of how any revenue might be shared with the photographers. There is no individual opt-out for Getty contributors – I wonder if this includes me, because I seem to recall allowing Flickr to pass on my images to Getty, so that they could charge for them and reward me with big money. (It hasn’t happened yet.) All my Flickr images are CC licensed anyway, so I have no problem with that, but I can see that it might be worrying for professional photographers. Published on 2012-06-06 in software and technology. I have a standard, non-jailbroken iPhone 4. This morning, randomly, a message popped up asking me to enter my iMessage password. On a PC I would have been suspicious, but Apple have been doing odd things with their security lately, so I responded. Then it asked the same question about Facetime. Ditto. A few minutes later, entirely by coincidence, I attempted to access my Apple account via iTunes, and my password was not recognised. I reset the password and checked the account – thankfully nothing purchased. Still, this is odd and surely related to the now-suspicious question on my iPhone. I’ve had a quick Google and seen nothing about this kind of behaviour reported anywhere, but if other people get that prompt and have their password changed, maybe they’ll find this when they search. Another data point. I don’t know how to tell Apple, and in my previous experience that’s a black hole anyway so I didn’t try very hard. Published on 2011-08-19 in technology. Tags: apple, exchange, tesco. I like my iPad 2, and am happy to admit that it is an expensive toy. However, I did find out this week that at least some of that expense is justified. My previous experience of taking back a faulty product was a cheap TV from Tesco (just £80) which occasionally turned on with no sound. Annoyingly, none of those occasions was in the Tesco Tech Support department. The man there just would not accept my word that the thing was broken. Shouting ensued, Donna used her retail experience to attempt reasoned debate and eventually satisfaction was reached with an exchange made as a “goodwill gesture” on behalf of the management. So, when my 3 month old iPad developed an odd small white patch on the display, I was a little concerned that it might need some explaining. Not so. The greeter at the door looked at it, almost gasped with horror, and said I must take it to the Genius Bar. I would need an appointment, he said, but he could make that for me and as it was just gone 5 to 6 on a Wednesday evening that appointment would be in 3 minutes. 3 minutes later the Genius at the Genius Bar asked what the problem was and when I showed him he immediately said they would replace it right away, as long as I had backed it up recently. The only delay was finding a relevant tick box in his on-line form to describe the fault. He chose “other display”. A quick squint down the headphone socket to prove that it hadn’t been wet, and I left the Apple Store after 13 minutes with a new iPad. Now that, Tesco, is customer service. Published on 2011-07-26 in media, music, radio and technology. Tags: sonos. I’ve tried to avoid buying a Sonos Multi-Room Music System ever since I first read about them back in 2005 but in March I finally succumbed and I haven’t regretted it for a second. 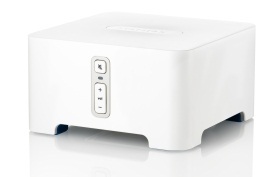 I have our music library on a LaCie NAS, which has a Twonky DLNA server onboard, but either it isn’t very good or the devices I attached never really got on with it. Those devices included the PlayStation 3, a Philips Streamium and a Pure network radio. Even when they did work, choosing what to play was never completely satisfactory – either a single track, a single album or a “genre”. On a recent visit to Alf & Anne’s we saw Alf’s latest HiFi extravagance – a whole bunch of Sonos kit. Within 5 minutes we had queued up a selection of tunes ready to play from his library on the CR100 controller. I connected my netbook to his WiFi, downloaded the Sonos Windows Controller, and could add more music through that. Wen liked it too! Some web research and advice from Alf showed that I needed a ZP90 to connect to the AV receiver in the living room and the network (there was already an Ethernet hub behind the TV); and an S5 with a cheap (as now obsolete) CR100 controller for the kitchen/dining room (sitting in the hatch where the, frankly shoddy, Pure Digital Evoke flow then was). That was Sunday. I ordered the kit on Monday from Simply Sonos and it arrived on Tuesday. Sadly, the S5 was a little too big to perch in the hatch, so when the kitchen renovation was finished we moved it to the top of the ‘fridge and I had to order another (black) S5 for the dining room. That was just three weeks later. It works superbly. It plays all the CDs we had ripped to MP3 directly from the Samba share on the LaCie. It does this so successfully that we have removed the CD player and speakers from the living room so that all the music now comes from the ZP90 via the AV system – which also has the record deck connected to it. (Oh yes, there’s still room for vinyl, and the line-in on the ZP90 means that LPs and 45s can be streamed around the house as well.) I’m also in the process of ripping the remaining CDs so that they can all be stored somewhere else. 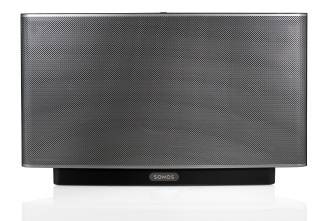 We’ve listened to much more music since we got the Sonos – sometimes even in preference to randomly turning on the TV. There are thousands of internet radio stations: the alarm function plays Radio 1 in the mornings (slightly later on Fridays) and we listened to Robyn on WUSC. There is Last FM if you want to hear music similar to bands you like and for Scrobbling (you can see the last 10 tracks we played under Listen at the right). A subscription to Spotify would get you almost unlimited streaming music. I also bought my first digital-only album, although I’m not committed to that. I even used the Sonos as an excuse to get an iPad 2. The Sonos controller app looks really good on the iPad, and is easier to use than the PC application. 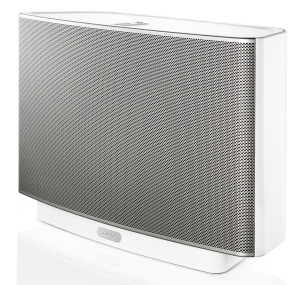 Sonos have recently launched the Play:3, a (slightly) cheaper 3 speaker player, and I’m fairly sure it will soon replace the stereo in the bedroom which has a dodgy CD player, a single alarm and a clock which loses a minute a day. Published on 2010-11-22 in software. I am migrating an application from Windows CE 5 to Windows Embedded CE 6. Just a little thing with a couple of dialogue boxes to exercise the hardware. At the client’s request, it used MFC. MFC and ATL 4.0 are no longer supported directly but most of the functionality is in the new ATL 8.0.
atlmfc.h is some nested include from afxwin.h and I am obviously not going to be editing that to make this work. What have I missed? I tried various orders of header inclusion, a few random definitions from suggestions on the ‘net, but nothing worked. Somebody suggested including atlosapice.h, but that threw up even more errors and left the C2039 as well. Searching how to fix that led me to a Google Group microsoft.public.vc.language and a comment that changing the order of include directories removed some undefined errors. Specifically, Paul Heil mentioned that he put some directories after .\ce\include and .\ce\atlmfc\include. Bing! .\ce\include! I’m not using that at all! I added it to the top of my include list and VC is now quite happy with “_time64”. I’m not sure what header files it was getting instead of those in “.\ce\include”, but they were certainly not the right ones. Published on 2010-11-17 in stupid and technology. Your Facebook account was accessed using 'Trillian' (Tomorrow at 00:02). Was this you? If so, you can disregard the rest of this email. protect your account information, visit the Help Centre. Please note: Facebook will never request your login information through email. I wonder what else they know that I am going to do? Published on 2010-10-31 in media, politics and technology. There are reports of people being outraged that the Google StreetView camera cars accidentally captured snippets of unsecured WiFi traffic as they wandered the land. I don’t really see the point of this – I’m pleased when Google can tell me where I am using this WiFi location information rather than the crappy GPS in my phone. The outrage must surely be manufactured, but why? Do they seriously think Google is going to start emptying their bank accounts? Just because the Daily Mail is insanely interested in the intimate details of everybody’s life (particularly if you are a famous everybody), doesn’t mean that Google is going to start publishing the contents of any emails they found. It was bad enough when the NIMBYs complained about the photographing of the outside of their houses from the street as an invasion of their privacy. To those I say “Either grow a hedge or put your clothes on whilst you are gardening.” And look up “private” sometime. Now, people who are too lazy or stupid to turn on the security in their WiFi are complaining that small fragments of their communications might have been recorded by a passing camera car. It’s the criminals sat in the small van with a laptop that they ought to be worried about. Or the security forces who’ve just been promised £2 billion to store every web site you visit for your own protection against “terrorism”. Is it just an anti-Google agenda, or is it a distraction from the Government’s far more serious snooping with intent? I know who I trust: Google, criminals, government, Daily Mail. Published on 2010-10-15 in blog, media, software and technology. I am now a confirmed fan of WordPress. This blog introduced me to it, but I’ve recently been using it to create a new website for the Willingham Photo Club. I’m currently one of the “gang of four” leadership team (there’s a rotating membership – all very communist) – having volunteered mainly in order to improve the club’s IT for viewing photographs on-screen at the monthly meetings. It fell on our watch to organise our first exhibition as part of the Willingham Feast. It seemed obvious as part of the planning to have a website to send visitors to, and afterwards to continue the exhibition in the virtual world. There are so many themes, plugins and widgets available to make a WordPress site look good, even the free ones, that it’s mostly a filtering task to choose what you need. The results can look professional, and certainly give the impression that much more skill and hard work has been involved than is the case. (Having said that, the list of minor tweaks and edits to get it to look “just right” is getting longer.) I’m basking in that reflected glory, but it is an easy-to-please audience of non-technical people, so far. I’ll finish by crediting the Theme: Modularity Lite 1.2, and Plugins: The Events Calendar, NextGEN Gallery and NextGEN Public Uploader, which have made it so easy to do. Check them out next time you need to make a website for a photography club. So that’s where my evenings have gone. I’ll just point out that if anybody mentions “display boards” in my vicinity in the near future, they’d better be on guard.